Takeaway: Fall harnesses have to be inspected before every use, even when you're working alone. A van pulls up to the jobsite and a service worker gets out, ready to tackle the case of the malfunctioning street light. He prepares his bucket truck and pulls out his fall harness. It’s old and ratty—probably not much help. So, he leaves it inside the truck and climbs into the bucket. He has to get the job done. By failing to wear a safety harness, this lone worker put himself at serious risk for injury or death. OSHA regulation 1910.67 mandates that workers in buckets must wear fall protection equipment, with the lanyard connected to an anchor point on the boom or bucket. Failing to do so can have serious consequences. Mechanical failures can result in buckets flipping or separating from the boom, causing workers to fall. There have also been incidents of line trucks being struck by passing vehicles, launching the worker out of the bucket. According to OSHA, falls are among the most common causes of serious work-related injuries and deaths (learn more about OSHA's Fatal Four). In fact, they are the number one cause of worker fatalities in the construction industry and the largest safety threat to lone workers. In 2015 alone, nearly 40 percent of construction worker deaths were caused by falls. 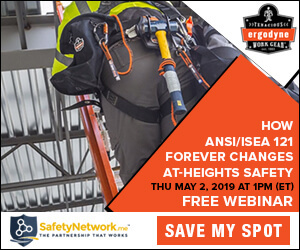 Fall harnesses, then, are critical to keeping workers safe, but they are only effective if they are functioning properly. Lone workers at heights must take extra precautions and need the training to properly ensure their own safety. Harnesses must be inspected before each use—even if that means multiple times per day—so it’s important that lone workers understand how to complete a fall harness inspection by themselves. Inspect your safety harness for wear and tear frequently. OSHA regulations require inspecting personal fall arrest systems prior to each use for wear, damage, and other deterioration. Harness conditions can change after just one use, so a weekly or even daily inspection won't cut it. Defective components must be removed from service immediately. If your inspection raises even the slightest doubt about the safety of your equipment, report your concerns to a supervisor and do not use it. Remember, the inspection is only as good as the inspector. Follow this guide to ensure your inspection is thorough and that your fall harness and accompanying lifeline or lanyard meets standard safety requirements (see Choosing the Right Fall Protection Lanyard to make sure you're using the right one for the job). Hold the connecting device with your hands six to eight inches apart. Bend the webbing in an inverted “U” to cause surface tension and expose problem areas. Inspect the entire surface of the webbing for damage, starting at one end and moving along each surface of the harness. Your company must provide you with training and ensure you are comfortable inspecting your own fall harness. They should also provide a fall harness checklist, along with a fall lanyard checklist, to assist you in completing your inspection. If you’re unsure about anything, ask for clarification or request additional training. When Is Fall Harness Maintenance Required? Maintenance is required whenever any of the signs listed above are present during an inspection. Make sure all repair work is done by an authorized repair facility and don't use the harness again until it has been re-certified and deemed safe for use. Every piece of fall protection equipment should be inspected, serviced, and re-certified on an annual basis. The inspector must be trained and competent and keep written records of inspection and approval. OSHA regulations mandate that all fall arrest devices should be serviced after a fall has occurred. Standard industry practice, however, is to remove the item from use and destroy it. After all, it has served its purpose. Most harnesses are equipped with indicators that signify the harness has seen impact. This may be plastic designed to break, loose D-rings with an exposed alert color, or popped stitches on the back strap. These signs indicate that a harness should be removed from use immediately. Basic care can prolong the life of your fall harness and help it perform to its full potential. Make it a habit to clean your harness as soon as possible after you finish using it so it remains in top-notch condition. Fall safety is a major concern for anyone working at height, and even more so for lone workers. It is absolutely imperative to ensure your safety harness and its components are inspected before every use, without exception. By law, employers have to educate employees on fall prevention and how to use and inspect fall arrest systems. Educate yourself and learn how to recognize the signs that your harness is not safe to use. Injuries and fatalities related to falls are often preventable with the correct use of well-maintained safety equipment. Take action to protect yourself now. Don’t become a statistic.